Without sacrificing any of the solidity, astringency or brutality akin to their previous blood-lettings, Zu spit out their most astral of recordings. The map as charted out by Carboniferous and Goodnight, Civilization sets Cortar Todo in another frame of reference: the transmundane is portrayed in a musical experience which dances on the shadows of previous experiments, as the new ideas rise a level up towards certitude. As we could expect, Cortar Todo ('cut everything' in Spanish) becomes its own island and dodges any kind of possible labelling one might throw at it. This being somewhat of a Zu trademark, which more often than not renders them classified under genres which seem inadequate to their unconventional noteworthy sound. Sonic traditions which remind one of processional marches, 19th century factory machinery, fists in the face, but also of unceasing waterfalls, defibrillators, and the inner workings of warm-blooded animals. Here, they come forth as modern hymns, sung into the air more expansively than ever. 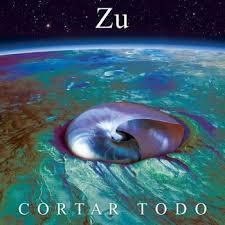 There is something to be said for Zu in general, whichever their configuration, their music is something to get lost in, willing or otherwise. Leaving the proverbial (and irrelevant) trail of breadcrumbs is perhaps to be advised - or discouraged. Let the ear be the judge. Loyalty to the instrumental tradition in the making of such "theory-laden" music results in a very precise observation of what the specific anatomies of listening attention and disorientation are, and it shows just how caginess can be attained even when the final result is to be the notorious, ever relentless wall of sound. This we could expect from Zu, and those familiar with their previous work will agree that their style is generally characterised by the radical, martial audacity they enact on the ear. Brain-draining and muscle-cramping, the voluptuousness of these recordings presents itself as a worthy anthem of the disinterested reality of our age. Of the banal oscillation of human life. Of the invisible promised grail. Concurrent exorcisms of sax, drums and bass - all of them overdriven to the limits of playing and listening capacity. The experience, as if an exploration into phenomenology, is challenging if one is unwilling to let go of expectancy. The sound's investigation into how long a particular gesture should last, or what the contours of musical structure are, remind the ear of previous encounters of the kind with musicians like Radigue or Riley. The ferocity of the bass and drums give way to the hints of lung brought forth by the saxophone, dancing on the swordy edge of improvised dementia and choreographed catastrophe. The varied backgrounds of the track titles perhaps reflect devotedness to several truths, or: to the impossibility of any actual consequential truth. That is to say: whether you've got a few pieces of the puzzle, or the desire to disregard the idea of the world as a puzzle altogether, both choices are fine, acceptable. Navigable. The truth is, as any other reality we might be willing to consume; in this new album we can be found in being lost. In its somewhat aggressive tone, it does seem to hint at the fact that any perspective in the plurality of commonalities or differences that can be explored on this planet is a valid one. Or a real one, at least. In the sonic tower that is Cortar Todo, there lurks a promise of bifurcation of timelines between ultimate freedom from incertitude or eternal damnation anchored on the indefiniteness granted to us by the human condition. Listening to this record feels like attempting to escape from a beast inevitable, which is in turn trying hard to hide itself away from us. And as it resists observation, we might realise that among its seemingly disorganised nature, the orderly tradition of persistence lives on. Transformation, whether in ecstasy or in absolute damnation, is achieved by a strange combination of athletic composition and heavy-duty assembly.